Cowgirl Softball Advances to State for 2nd Time in School History! 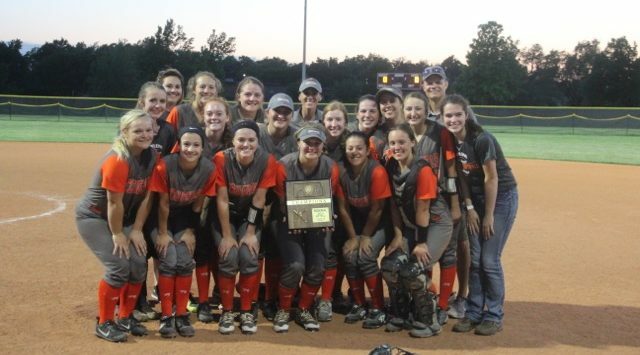 The Abilene Cowgirl Softball Team advanced to the State Softball Tournament for the second time in school history Tuesday night with a pair of wins over McPherson and Hays. Abilene entered the Buhler Regional as the #2 seed with a 6-14 record. The Cowgirls defeated #3 McPherson 9-0 in the semifinals and #1 Hays 12-6 in the championship at Wheatland Park. Abilene capitalized on McPherson errors in the semifinals. The Cowgirls broke through in the bottom of the fourth inning with three runs, in what had been a scoreless game. In the fourth, Abilene’s Emily Burt grounded to McPherson second baseman Emily Smith, who committed an error on her throw to first base, which allowed Abilene to score the first two runs of the game. The Cowgirls were able to score three runs that inning all with two outs. The Lady Bull Pups didn’t commit a single error in the first three innings but had 7 errors over the final three innings which led to four Abilene runs in the 5th and two more runs in the 6th. Cowgirl Junior, Maci Debenham led the way with three hits, two runs scored and a RBI. Junior pitcher, Emily Burt pitched a complete game shut-out. In the championship, Abilene fell behind 3-0 in the first inning but would score four runs in the top of the fourth and wouldn’t trail the rest of the game. The Cowgirls would go on to score 12 unanswered runs with most of the damage coming in the fourth inning. In that inning, Abilene scored 8 runs and sent 12 players to the plate. The Cowgirls once again benefitted from errors as Hays committed five in the inning and seven in the game. Juniors Rylie Volkman and Burt along with Senior Brett Short all had two hits and two runs scored for the Cowgirls. Burt pitched the entire game for her second victory of the Regional. McPherson ended their season 4-17 and Hays 11-11. Abilene last made it to state in 2009, that year the Cowgirls finished in 4th place. Abilene will play at the Trusler Sports Complex next Thursday in Emporia against an opponent to be determined.